Lawmakers may have dumped their agreement with APC leadership to pull the brakes on their plan to override the President’s veto of the Electoral Amendment Bill reversing the order of elections. 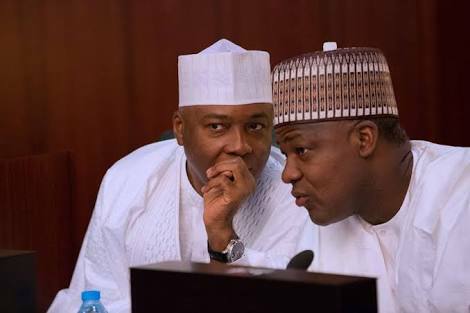 Unless the National Caucus meeting of the APC slated for today at the Aso Villa and the National Executive Committee (NEC) meeting billed for tomorrow can convince Senator Bukola Saraki and Speaker Yakubu Dogara to get their colleagues to back off; the Senate and the House of Reps are likely to proceed with the plan. The Nation reports that supporters of the bill have alleged that “some powerful individuals sympathetic to the President” at the weekend perfected a plan to bribe National Assembly members. The allegation is that pro-Buhari senators might receive $50,000 each. House of Reps members sympathetic to the President will each receive $30,000 to “kill the amendment”, which was initiated by the lawmakers. “They are diverting attention from their plan, “a pro- Buhari senator said at the weekend. Lawmakers in support of the bill said the plot to bribe National Assembly members was perfected at “some high profile meetings “in Abuja at the weekend. The meeting was also said to have resolved that “anti-executive lawmakers who have cases with anti-corruption agencies should be threatened with prosecution in days to come”. Those said to have attended were some pro-Buhari governors from the Northwest , the Northcentral and the Northeast. A “minister from Southsouth” was also said to be present. In withholding assent to the bill, the President argued that the amendment by the lawmakers infringed on the constitutional powers of INEC. The President also said that the passage of the bill could lead to a situation where the National Assembly would be seen as legislating for the states on local government management. The Legal Department of the National Assembly, however, faulted the points raised by President Buhari to withhold assent to the bill. It advised the lawmakers to go ahead with overriding the veto if they so wished. The President’s action has further polarised both chambers of the assembly, with those in his support claiming that 54 out of the 109 senators have indicated their intention to vote against overriding the veto. An anti-Buhari senator rejected the claim that 54 senators might vote against overriding the veto. “But for the death of Senator Ali Wakili (Bauchi South) the Senate would have voted on the veto last Thursday. And all this would have been laid to rest, “ he said. A source at the weekend insisted that the plan to override President Buhari’s veto was “still very much on”. The National Assembly has continued with mobilising for signatures in support of a possible override of the President’s veto. The source claimed that 67 senators had signed “a pro-Senate register to override the President’s veto. The number, said to have been in a register kept by a Northeast senator, the source claimed, swelled to 67 from last week’s 63. According to the source, “the number of senators might rise far beyond 80 if the more than 20 others said to be sitting on the fence sign up this week”. It was also learnt that pro-Buhari senators are unrelenting in their push to stall the plot to override the President. The source said: “The Pro-Saraki group has encouraged some of its members to infiltrate the rank of the Pro-Buhari group to give them a false sense of hope that they are greater in number. That makes the pro-Buhari group have a false sense of improvement but the senators know where they really belong. "A meeting of the pro- Senate group held in Lagos after the wedding party of the daughter of Africa’s richest man, Aliko Dangote, at the weekend. The meeting afforded the Pro-Senate Senators the opportunity to review the register and it was affirmed that 67 senators have so far signed,” the source said. He noted that about 20 senators believed to be sitting on the fence who had been neutral in the meetings of the Pro-Senate and Pro-Buhari so far are set to sign the register. It was learnt that three Senior Advocates of Nigeria (SANs) joined the Senators at the Lagos meeting. The Lagos meeting, it was gathered, adopted the interpretation of the law that the two-thirds majority required to override the President’s veto are “those present in each chamber and not two-thirds majority of all members of the Senate or the House”. The source noted that baring last-minute changes, “the plan to over ride Mr President may start this week because the Senate leadership is sure of sufficient number to act and get the desired results”. Senate Committee chairman on Police Affairs, Senator Abu Ibrahim insisted that the Electoral Act amendment 2018 is Peoples Democratic Party (PDP) agenda aimed at frustrating the APC during the 2019 election. The Katsina South lawmaker, who spoke in Abuja, insisted that those plotting to override the President’s assent on the Bill will fail. To him, it is practically impossible for those plotting to override the assent of the President to secure two-third majority on the floor of the upper chamber. Ibrahim described the adoption of the conference report which placed presidential election last in reordered sequence of elections as an afterthought that will be defeated on the floor of the Senate. “Even if the National Assembly has the power to reorder election sequence, it remained an afterthought coming when it did. On the legal advice which dismissed the premise upon which President Buhari withheld assent to the Bill, Ibrahim noted that whatever the legal advice might be, it will still come to the floor of the Senate for consideration. Ibrahim asked Nigerians not to worry about the Bill since “it will die a natural death”. Nigerians, he said, should rather worry about the inability of the National Assembly to pass the 2018 budget months after it was presented. He also said that Nigerians should be worried about the inability of the Senate to confirm many nominees forwarded to it for consideration and approval. On the insinuation that the leadership of the National Assembly is divided on the Bill, Ibrahim said that might not be far from the truth since the leadership has not spoken openly about the Bill.